Hickory | Buckhannon, WV | AFP Logs & Lumber, Inc. The heaviest of American hardwoods, the hickories can be difficult to machine and glue, and are very hard to work with hand tools, so care is needed. They hold nails and screws well, but there is a tendency to split so pre-boring is advised. The wood can be sanded to a good finish. 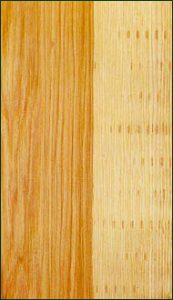 The grain pattern welcomes a full range of medium-to-dark finishes and bleaching treatments. It can be difficult to dry and has high shrinkage. Tool handles, furniture, cabinetry, flooring, paneling, wooden ladders, dowels and sporting goods. Typically sawn in 4/4 thicknesses. 2.2% of total U.S. hardwoods commercially available.